When your kidneys fail, wastes that normally leave the body in your urine remain in your bloodstream. These wastes can become toxic, making you feel sick and causing damage to your heart, lungs, bones and other tissues. The good news is, what you eat affects the waste buildup in your blood — this means you have the power to lower the waste buildup by changing your diet. If you stick to a diet appropriate for your overall health — including the type or stage of kidney disease you have and the treatment you receive — you will feel better and have more energy. A dietitian who specializes in nutrition for chronic kidney disease patients can work with you to plan meals that are healthy and delicious. Ask your kidney doctor (nephrologist) to refer you to a dietitian or, once you’re a patient at Puget Sound Kidney Centers, we’ll assign one of our renal dietitians to you. You’ll meet with your dietitian regularly to discuss the diet that’s right for you. There are certain areas of your diet you need to pay close attention to if you have been diagnosed with chronic kidney disease but have not yet started dialysis. Sodium intake is incredibly important (you can slow the progression of chronic kidney disease if you lower your salt intake) but there are other minerals and types of foods you should watch as well. Dietary proteins include meat, fish, poultry, eggs, milk and bread — foods often associated with growth and strength. However, when kidneys stop working properly, they can find it difficult to filter out waste from protein. Your dietitian will calculate how much protein you need, depending on your kidney function, body size and overall health, to ensure your kidneys are able to cope with the waste. If too much sodium builds up in your body it can raise your blood pressure and damage your kidneys and heart. The sodium in your diet comes from the food you eat and the salt you add. Examples of foods high in salt include canned soup, luncheon meats, pickles, cured meats, snack foods, cheese, TV dinners, soy sauce, seasoning salt, fast foods and many restaurant foods. Most ready meals contain a lot of salt so it’s good practice to read nutrition labels and cook at home (check out our favorite low-salt recipes) whenever possible. Below are some low-salt foods to try. Check with your dietitian to make sure ones you like can be added to your diet. Phosphorus is a mineral that works with calcium to make your bones and teeth. Kidneys normally get rid of extra phosphorus but when they aren’t working well, phosphorous builds up in your blood. The extra phosphorus combines with calcium in your blood and damages your heart, lungs and blood vessels. Therefore, you may need to reduce your phosphorus intake. Phosphorus is found in almost all foods but is especially high in meat, milk, cheese, cottage cheese, yogurt, dried beans and nuts. A low phosphorus diet has been linked to slowing kidney damage so ask you doctor about your blood phosphorus level. If it is high, a dietitian can help you plan a low phosphorus diet. Potassium is a mineral found in many foods, but mostly in fruits and vegetables. Healthy kidneys get rid of the potassium your body doesn’t need but when your kidneys aren’t working well, it builds up in your blood. If your blood potassium level is high, your kidney doctor will refer you to a dietitian who can help you plan a low potassium diet. Because patients with chronic kidney disease have to pay close attention to their intake of protein and certain minerals, you may not be getting enough vitamins from the foods you eat. Ask your doctor or dietitian about what vitamins you can take as some types are better for patients with kidney disease. It is very common for people with kidney disease to have a low appetite. If your appetite has decreased or if you are following a low protein diet, you may not be eating enough calories to stay healthy. It is very important that you maintain a healthy weight when you have kidney disease so check with your dietitian if you are losing body weight. Even if you are overweight, it is important to eat enough protein and calories to support your body. > How can exercise help people with chronic kidney disease? Read the label. Compare nutrition labels of similar products and choose brands that are the lowest in sodium. Your daily goal should be less than 2,000 milligrams of sodium. Keep a journal. Write down what you eat, and how much sodium is in each food you eat, to see how much sodium you consume each day. Share the journal with your dietitian to better manage your sodium intake. Eat in instead of out. Fast food and restaurant meals can be incredibly high in salt. Take a cooking class and learn how to make tasty low-sodium meals at home. Or, take a look at some of our low-salt recipes now. Drain canned goods. Rinse the salt off canned goods like vegetables and tuna fish. Drain the food and empty it into a colander. Place under running tap water for a few minutes, then prepare as usual. Don’t add extra salt. Use herbs and spices instead of table salt. You can still add flavor to your meal without adding harmful sodium. Throw out packaged seasonings. If processed pasta and rice dishes are not something you think you can give up, throw away the spice packets (they are loaded with salt!) and add your own fresh or dried herbs and spices. Stick with it. Within 45 days of following a low-salt diet, your taste buds will change and high-sodium foods will no longer taste good. It may seem hard at first but don’t get discouraged! Consult the experts. Food labels can be confusing (some contain potassium chloride instead of salt, which can also be dangerous for people with kidney disease) and some low-salt foods might still not be good for you, so double check foods with your dietitian. Check out more nutrition resources. Consider signing up for the National Kidney Foundation’s ‘My Kidney Coach’ to access more nutrition tips and recipes. Once you start dialysis, you’ll probably need to adjust your diet again. There are several things you need to limit — sodium, phosphorus, potassium and fluid — and others — protein and calories — you might need to increase. Protein is used by the body to build new tissues and replace old or damaged tissues. 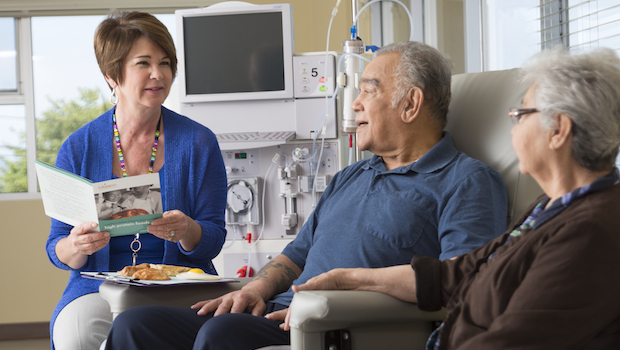 When you are on dialysis you should eat protein every day. Good quality protein is found in unsalted meats, fish, shellfish, poultry, eggs, beans and nuts. If you have been on a low protein diet, you should start eating more protein now. You still need to limit your sodium. Most importantly, continue to avoid ready meals and most restaurant meals, as these are usually very high in salt. Cook your food without salt and don’t add any salt at the table. Instead, season with lemon or lime, vinegar, onion, garlic, herbs or salt-free broth. Limit ready meals, fast food, cured and processed meats and high-salt condiments. Continue to choose foods low in phosphorus. Dairy products can be particularly high in phosphorus so eat only one dairy product per day, such as one cup of milk, ice cream, pudding, custard or yogurt, or have one slice of cheese. In addition to limiting foods high in phosphorus, you may need to take ‘phosphate binders.’ These medications bind with the phosphorus in your food and pass out of your body through stool, preventing too much phosphorus from building up in your body. If your doctor has recommended taking phosphate binders, be sure to take them when you eat. Continue to choose foods low in potassium, such as broccoli and carrots. Limit fruits, vegetables and juices to 4 to 6 half-cup servings per day. Avoid salt substitutes and foods containing potassium chloride. Continue to pay attention to your calorie intake. Your appetite may remain low while you are on dialysis but you still need to consume the amount of calories necessary to maintain good health. There are many healthy ways to add extra calories to your diet. Work with your dietitian to find higher calorie (but still healthy!) recipes or consider using nutrition supplements such as Nepro, Ensure Plus or Boost Plus. You will need to limit your fluid while on dialysis. Most people on dialysis can drink three cups of fluid each day plus the amount equal to their urine output or a total of 4 to 5 cups per day. Fluids include all drinks such as coffee, tea, juice and water. Foods that are liquid at room temperature (soups) or melt and become liquid at room temperature (Jell-O, ice cream and ice, for example) are also fluids and need to be counted into your daily fluid allowance. Your diet will be less restrictive if you’ve received a kidney transplant. However, you still need to ensure you are eating healthily to make sure your new kidney lasts as long as possible. Choose lean, low-sodium meats, poultry and fish. Continue to avoid processed foods, choose foods low in salt and avoid adding salt at the table. New kidney or not, you’ll be in better health if you cut the salt. Keep an eye on your phosphorus levels, although you don’t need to be as strict as you were when you were on dialysis. Drink low-fat milk and eat low-fat cheese. Eat the recommended five fruits and vegetables a day. Your dietitian will monitor your potassium to make sure it stays at a healthy level as some medications can cause your blood potassium level to be too high. Once you have a new kidney, it’s pretty simple in terms of calories — eat enough to maintain a healthy weight. Your new kidney will thank you (and last longer!) if you do. You will no longer have fluid restrictions. Drink lots of water and hydrating beverages. Choose foods high in fiber, such as whole grains, legumes and vegetables.